Contest: WIN: a Trip to see Elton John! WIN: a Trip to see Elton John! 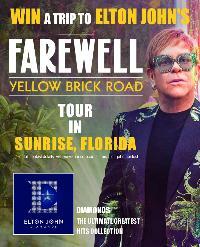 Prize: Trip for two: return flights, hotel for 2-nights, tickets to see ELTON JOHN in concert at BB&T Centre, in Sunshine, Florida, US. and $500 CAD spending cash. Statistics: This contest was opened by 88 and entered by 16 ContestChest.com members. 18% of those who opened the contest, entered it.